Simone Swan runs the Adobe Alliance in Presidio, Texas, which teaches traditional building techniques to provide low-cost housing. 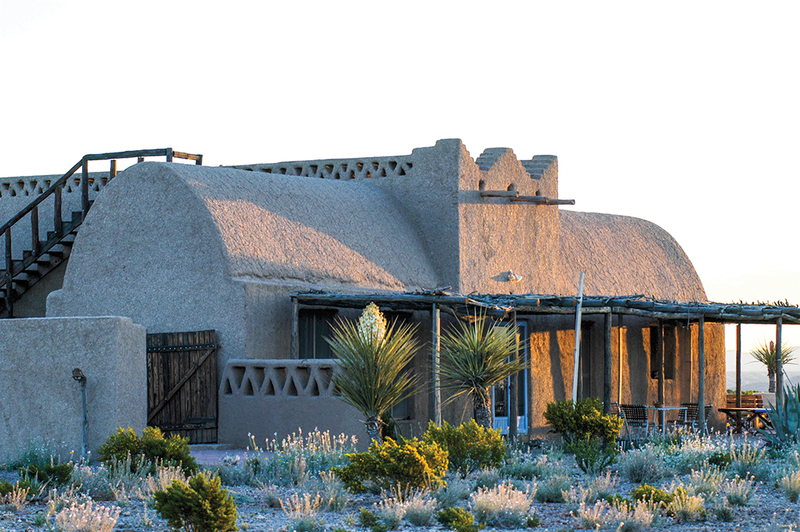 Under Swan’s direction, six earthen buildings — five homes and one business structure — have been built in a remote, yucca-studded swath of Big Bend country in far west Texas and Mexico. One is Swan’s demonstration home in Presidio, Texas, where her Adobe Alliance nonprofit has led adobe-building workshops attended by architecture and engineering students as well as industry experts seeking hands-on experience with Swan’s Egyptian-styled building techniques. While adobe has been indigenous to the region for centuries, Swan combines mud-brick homebuilding with the type of high vaulted roofs and domed architecture found in Egypt. This eliminates the need for costly roofing materials. In fact, for Swan, the road to Presidio went through Cairo. Some 20 years ago, she was vice president of a prominent Texas arts foundation, dividing her time between Manhattan and Houston, and brushing shoulders with the likes of Andy Warhol and other connections in art and architecture. Then she read Architecture for the Poor, by renowned Egyptian architect Hassan Fathy, and was inspired to travel to Cairo to apprentice under him. “Her love for adobe architecture started there. She just fell in love with the stuff,” says William Menking, editor of The Architect’s Newspaper in New York and a friend of Swan’s since the 1980s. He views Swan as perhaps the country’s most important advocate for adobe- and mud-brick architecture. Born in Belgium, Swan had already crossed the Atlantic by ship 16 times before age 10, so the apprenticeship in Egypt stoked her adventurous spirit. “I’m always ahead of my time,” she says, acknowledging that while the Egyptian techniques she learned are rooted in the past, they have a practical application in the future. “Over half the people on this planet live in earth houses,” she says. Dennis Dollens, professor of architecture at Universitat Internacional de Catalunya in Barcelona, refers to Swan’s buildings as “little architectural revolutions in adobe and mud plasters,” and further uses the idea of revolution to extend to her ideas of empowering the poor to build their own homes. “It all connects. She has long advocated for minorities and underemployed people living in the border region to view homebuilding as an empowering tool for their lives,” Dollens says. Currently, Swan’s efforts are geared toward restoring the Presidio demonstration home, which was damaged during atypically torrential desert rains in 2013 and 2014. Even this will probably become part of her blueprint for instructing others in what works — and what doesn’t — when it comes to adobe construction in the American Southwest. “That’s her legacy,” Menking says.